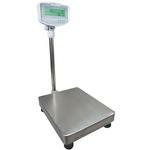 The GFC is a fully featured counting scale with numeric keypad for unit weight and sample entry. The bright large backlit display shows unit weight, total weight and number of pieces. A grade 304 stainless steel top pan with mild steel base and pillar mounted ABS plastic indicator, make the GFC a durable industrial floor counting scale. With features that are built to make counting quick and easy the GFC offers check counting for counting to a predefined weight or count. The RS-232 interface makes recording the results effortless with connection to printers and computers. Adam Equipment has been manufacturing balances and scales for over 35 years, providing professionals worldwide with quality products that are always the perfect balance of speed, performance, and value. Transmit information to computers and printers with the built in bi-directional RS-232 interface, for easy data recording and logging. A large backlit display clearly shows unit weight, weight and pieces for quick and easy readings making counting applications simple and trouble free. Color coded keypad make frequently used buttons instantly recognized for accuracy and the smart user interface makes learning and operating the scale simple and easy to do. A large stainless steel top pan can be removed for easy cleaning. A built in rechargeable battery means the GFC can be used where the parts are. Backlit LCD display shows, weight, average piece weight and number of pieces counted. © 2000 2019 scalesgalore.com All rights reserved.